Be honest: Were you naughty or nice this year? Well, it doesn’t really matter what the case is, because as the New Year is now in full view, you will get the chance to do things over again. A perfect resolution for 2013 could be a range of things including quitting smoking, saving more money, spending more time with your family or even implementing voice over Internet Protocol (VoIP) into your company. This next generation offering is continuing to pick up speed within small to medium-sized businesses (SMBs) as well as larger corporations. This is due to a variety of reasons including raising the bar on efficiency, and in turn, enhancing customer satisfaction levels in addition to significantly eliminating costs. In fact, according to VoIPReview.org, organizations normally pay 80 percent less on their monthly phone service when leveraging VoIP. Don’t believe me? I have proof! First, let us look at the story of debt settlement provider, Ethical Management Solutions, a company that recently teamed with VoIP provider RingCentral (News - Alert) . Before migrating to this robust platform, the firm was doling out somewhere between $8,000 and $9,000 per month in communication expenses for only 20 employees! After implementing VoIP into business operations, it was luckily able to cut this down dramatically and now reports that it only spends approximately $1,000 a month. With VoIP-based products, long distance calling rates are also shrunken, as they are powered via the Internet as opposed to a PSTN line. Hence, these calls can save any business a significant chunk of change right around the holiday season. When data is sent over the Internet, it is much cheaper than traveling through a standard phone line. Looking at another real life example, Vocalocity charges a mere $.03 per minute to make international calls to China, while ordinary phone services like AT&T (News - Alert) force users to pay upwards of $3.52 per minute to wireless phones in China. One more company making waves in the VoIP market is VoIP Innovations, a wholesale VoIP service provider who proves that excellent customer service is equally as important as cost savings when implementing VoIP. If you get a chance to look at the company’s testimonial page, you’ll be absolutely floored. Customers exclaim, “I just love working with companies like yours!” as well as describe the team at VoIP Innovations (News - Alert) “rockstars,” not to mention several reviews claiming that without VoIP Innovations’ efficiency and dedication, they would have lost good clients. Bottom line: the company brings the best of both worlds in cost savings and customer service that's out of this world. In conclusion, if you are in need of a cost-effective and extremely reliable communication suite that will ultimately help to expand your organization’s footprint in your respective industry, take a closer look at the bountiful benefits of VoIP before another year has passed. 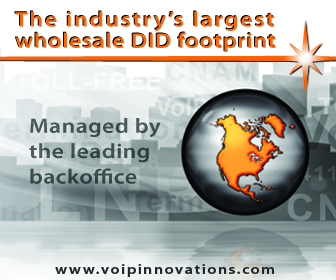 To find out more about VoIP Innovations, visit the company at ITEXPO Miami 2013. Taking place Jan. 29- Feb 1 in Miami, Florida, this event serves as the world’s largest communications conference and expo that teaches resellers, enterprises, SMBs and Government Agencies how to select IP-based voice, video, fax and unified communications to purchase or resell. Visit VoIP Innovations in booth #506. For more information on ITEXPO (News - Alert) Miami 2013, click here. *Jamie Epstein is a TMCnet Web Editor. Previously she interned at News 12 Long Island as a Reporter’s Assistant. After working as an Administrative Assistant for a year, she joined TMC as a Web Editor for TMCnet. Jamie grew up on the North Shore of Long Island and holds a bachelor’s degree in mass communication with a concentration in broadcasting from Five Towns College.